It is always hard to find quality smartphones both with lock free and neat customer support. Because most of the phones now a days comes with carrier lock. You have to use the same handset for almost two years. But you wish to buy an unlock mobile phone then you have to pay a higher price or get it without any warranty. If you are in Australia then I have something to share with you. 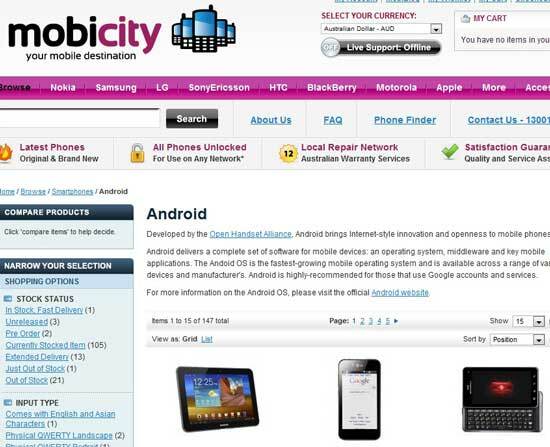 You can find all the latest Android phones with full Australian warranty in Mobicity at the cheapest price. Moreover they release every major Android phones even before international release. And if you wish they will also offer you 2 years of extended warranty with every unlocked carrier free droid phone within Australia. In this post I will show you the price of some most popular and new Android phones price in Australia offered by Mobicity. I am sure that these are the best android phones deal in Australia if you want to buy it without any kind of carrier lock. Mind that I mention the price in both US dollars and Australian dollars. Don't forget to check it.